Our services are custom tailored to meet the needs of our growing network of hobbyists, researchers, industry members, artists, and sponsors. We believe it is necessary to address all sides of the equation, creating a complete picture. The Central Florida Aquarium Society has deep history dating back to 1967, so it should come as no surprise that we aim to create, share and source knowledge. Knowledge doesn't come from few, it comes from many. Whether you have a question or an answer, this is a place for you to share and grow your knowledge. Although most of us have been fortunate enough to never have a customer service-related issue with a local shop, problems can arise. Often times, these matters are provided swift resolution by the shop owners directly, but what about the issues that fall through the cracks? 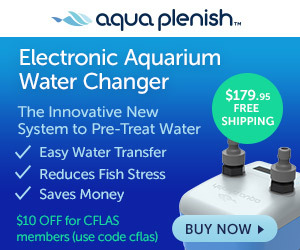 Rather than blasting the offending shop on social media complaining about your lackluster experience, the Central Florida Aquarium Society has an alternative solution! Log your complaint with us, providing the name of the shop, who you may have spoke with, the date and time of your visit, and details about the issue you encountered, and we will investigate the matter on your behalf. In nearly every case, we are able to work with the local shops to arrive at an agreement for resolution, but this may not always be the case. Should we encounter a rare occasions in which the local business refuses to work with us, or is outright disrespectful by ignoring our inquiries, the Central Florida Aquarium Society, in good faith, will not include this shop in our portfolio of local businesses that we support, until reparations have been made to the individual(s) whom have been wronged. Furthermore, in an effort to maintain transparency, the Central Florida Aquarium Society will release a public statement retracting its support from the named shop, accompanied by all supporting documentation related to our investigation. We believe that in doing so, we are keeping our promise to our community members, and local shops we work with that are in good standing, that we will fight on your behalf, for the greater good. Losing the patronage of a community member is something that no business should take lightly. We've got your back! We are always dreaming up fun events that we want you to get involved in! Whether it’s a calendar, aquaculture art exhibit, fish auction, swap meet, or just a group of hobbyists hanging out, we hope that you want to participate in sharing stories, DIY tips, and photos! In fact, did you know that just by liking and/or commenting on our social media posts is one of the most helpful, and easiest, things you can do to get involved? It’s true, so what are you waiting for? We love working with artists and photographers, regardless of skill level. We try to incorporate art as much as possible in our productions as we feel it enriches our aquaculture community. There are so many great pieces of art and photos out there that simply go unnoticed, and we aim to change this. There are multiple ways to share your work with the community. While some events are curated, our inbox is always available for sharing your work on our website and social media platforms. Simply email your artwork along with your information to [email protected]. Don't forget to include a website and any contact information that you would like to have published along with your artwork, as you never know who may be contacting you for commission work. We strive to bring hobbyists together to share information and experiences in a fun, family-friendly atmosphere. Whether young or old, experienced or beginner, we invite you to join our community. A fusion of Aquaculture, Ingenuity and Art isn't just a tagline, it's our motto. No matter what canvas you use to create art, we invite you to share it. Local artists can gain exposure through events and publications, while fish keepers can show off and critique their aquascapes and color morphs. By empowering the local creative minds to collaborate and produce, we aim to generate increased culture in the community. In turn, the boost in culture will give rise to additional creativity! With a rich history in Central Florida, dating back to 1967, our key focus continues to be bringing attention to the high quality of aquaculture type businesses we have in the area. Grow your advertising platform by becoming a sponsor! With a targeted local outreach approaching 30,000 individuals, this is the perfect stage to start your new advertising campaign! We connect producers and consumers, for the benefit of both! Connect with a wide variety of people of all backgrounds that share a common interest. Whether you want an easily accessible knowledge base, a panel of experts or just some local friends to share your aquarium with, we have it all.